(PhysOrg.com) -- The NASA Kepler Mission is designed to survey a portion of our region of the Milky Way Galaxy to discover Earth-size planets in or near the habitable zone, the region in a planetary system where liquid water can exist, and determine how many of the billions of stars in our galaxy have such planets. It now has another planet to add to its growing list. A research team led by Steve Howell, NASA Ames Research Center, has shown that one of the brightest stars in the Kepler star field has a planet with a radius only 1.6 that of the earths radius and a mass no greater that 10 earth masses, circling its parent star with a 2.8 day period. With such a short period, and such a bright star, the team of over 65 astronomers (that included David Silva, Ken Mighell and Mark Everett of NOAO) needed multiple telescopes on the ground to support and confirm their Kepler observations. These included the 4 meter Mayall telescope and the WIYN telescope at Kitt Peak National Observatory. 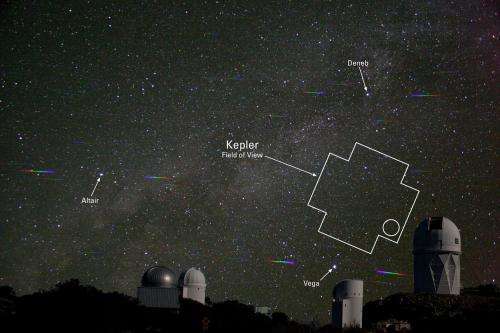 The accompanying figure shows the size of the Kepler field, seen over Kitt Peak. Figure 2: Kepler light curve of HD 179070 showing the eclipse of Kepler-21b. The data cover 15 months. The figure shows the binned, and phase folded-data based on 164 individual transits over-plotted by the model fit (red line). With a period of only 2.8 days, this planet, designated Kepler-21b, is only about 6 million km away from its parent star. By comparison Mercury, the closest planet to the sun, has a period of 88 days and a distance from the sun almost ten times greater, or 57 million km. So Kepler 21b is far hotter than any place humans could venture. The team calculates that the temperature at the surface of the planet is about 1900 K, or 2960 F. While this temperature is nowhere near the habitable zone in which liquid water might be found, the planets size is approaching that of the earth. The parent star, HD 179070, is quite similar to our sun: its mass is 1.3 solar masses, its radius is 1.9 solar radii, and its age, based on stellar models, is 2.84 billion years (or a bit younger than the suns 4.6 billion years). HD 179070 is spectral type F6 IV, a little hotter and brighter than the sun. By astronomical standards, HD 179070 is fairly close, at a distance from the sun of 352 light years. While it cannot be seen by the unaided eye, a small telescope can easily pick it out. Part of the difficulty in detecting this planet is the realization, from the Kepler mission, that many stars show short period brightness oscillations. The effect of these must be removed from the stellar light in order to uncover the regular, but very small, dimming caused by the planet passing in front of the star. The Kepler mission observed this field for over 15 months, and the team combined the observations to enable them to detect this tiny, periodic signal. They also relied on spectroscopic and imaging data from a number of ground based telescopes. The attached figure 2 shows a light curve: a plot of the brightness of HD 179070 over time as the planet passes in front of it. This curve was built up over the many months of observing. The results of this work have been accepted for publication in the Astrophysical Journal. Losing. Losing. Losing. Not Loosing. That's not even a word. Ha Ha, these people do make me laugh.